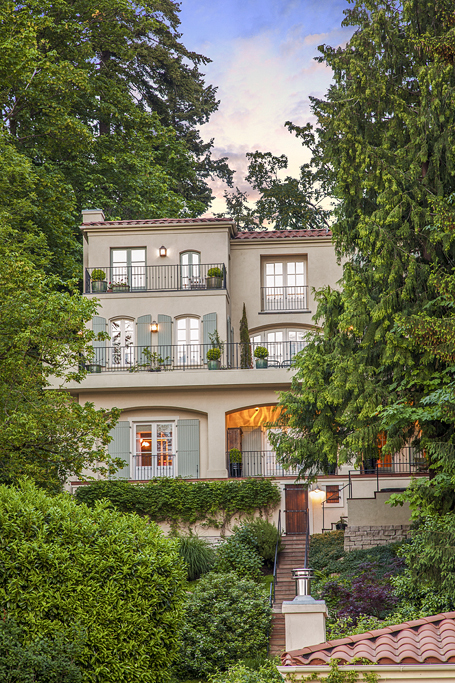 Maison des Volets - Exceptional west facing Mercer Island waterfront estate of exquisite material integrity and design signature to the earthy elegance of Provence. A synergy of structure and site, on shy half-acre with 61 feet of low bank waterfront, the residence artfully evokes casual classicism and natural beauty set upon gardens of controlled exuberance. Rare permanently protected views and privacy offer further distinction at this one of a kind property. A pair of beautifully crafted pine doors opens into the intimate entry to Maison des Volets expanding to more expansive great space to create a sense of intimacy and emphasize the evolving scale of the main level. This area is framed and enclosed by exposed wooden structure and decking that defines the large sunken central dining room and opens via arched French doors to a grand patio that artfully frames and complements the house’s most iconic Lake Washington view. 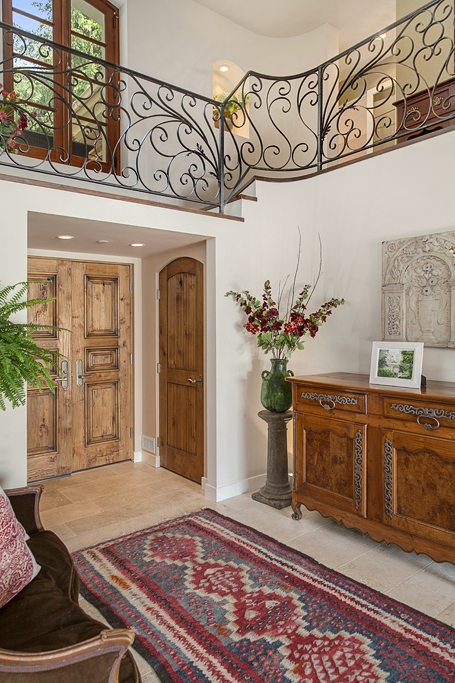 This delightful entry sets the stage for the material palette of Maison des Volets, with random, large format limestone floors and rustically hewn structural beams, accented by handcrafted pine doors from Arizona. Spot lighting has been carefully hidden in the beam structure to provide both specific and ambient lighting, and the coat closet door is a beautifully fluted custom piece. Limestone floors and wooden structure continue into the LIVING ROOM, which is anchored by a stunning 18th Century French fireplace carved from limestone and imported from the Loire Valley. Arch-topped natural finish casement windows surround the room, welcoming peaceful lake and garden views, and flooding the room with natural light, while a meticulously crafted custom bookcase provides plenty of storage and display space. 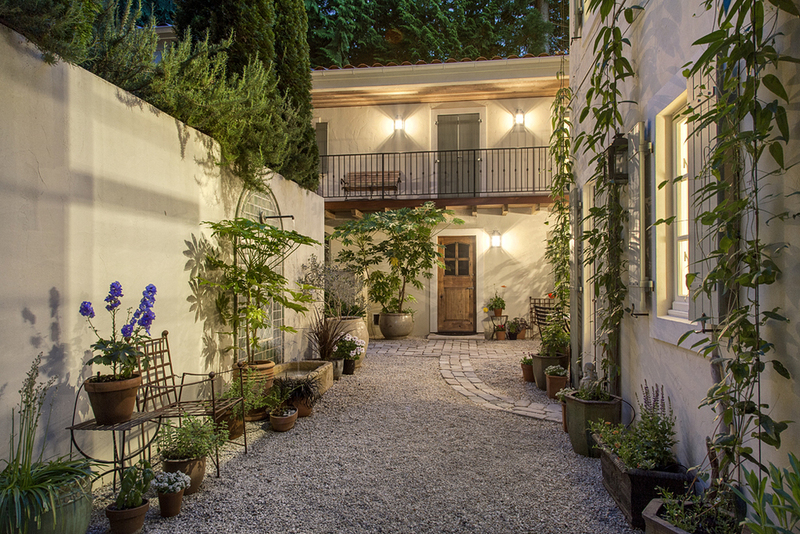 A private and autonomous guest suite lies in the northeast corner of the house, opening onto the crushed stone entry courtyard and its peaceful tile and stone fountain via French doors. It is served by a full ensuite bath with a large shower, pedestal sink and private lavatory area. A large powder room with an antique pine vanity sits between the guest suite and living room. The north side of the main floor is occupied by the gourmet kitchen, casual dining area, pantry and den, and opens onto the patio through several sets of French doors for a spectacular connection to the outdoors. 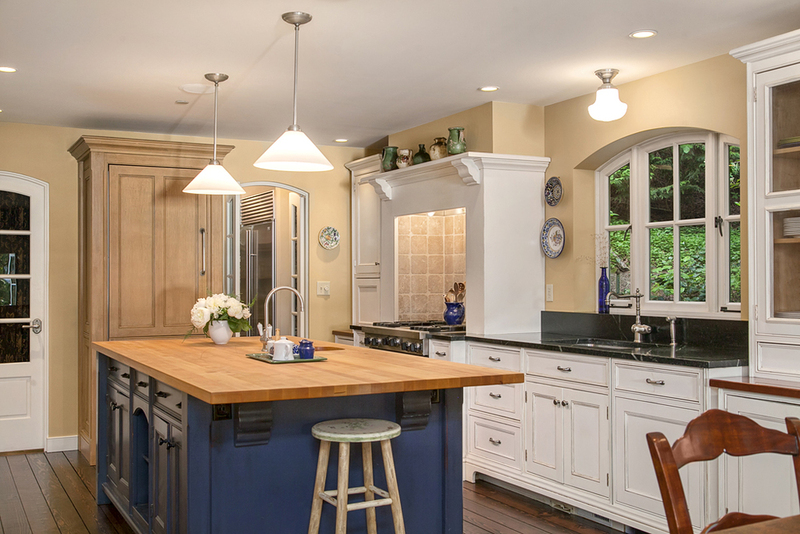 The KITCHEN is designed to be an eclectic blend of furniture and cabinet styles thoughtfully evoking the more rustic and evolved cooking areas found in period French farmhouses. Numerous freestanding and built-in piecesprovide ample storage and cooking space, and combines fine distressed paint finishes with natural alder. 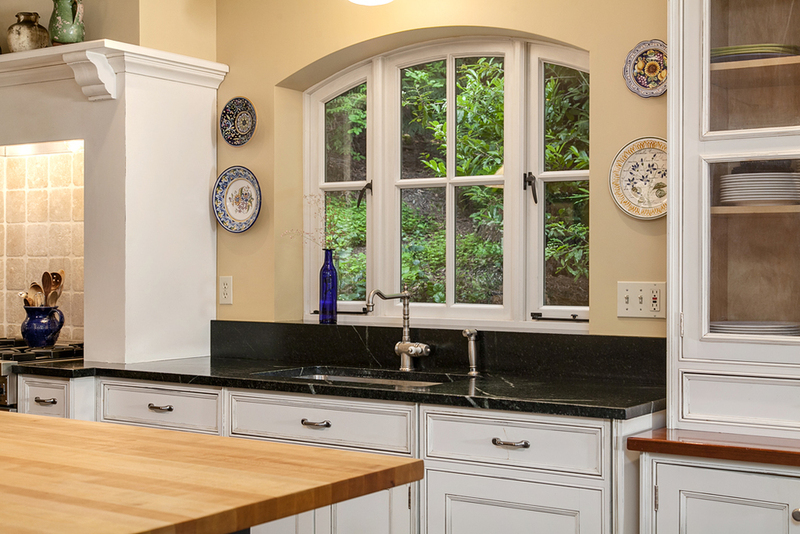 Counters are crafted from soapstone, finished hardwood and butcher block, with dishwasher and primary refrigerator paneled to match. Top-of-the-line appliances include a concealed Miele dishwasher and SubZero built-in refrigeration with two drawers, as well as a four burner Viking range and a flat top, set into a limestone cooking alcove that conceals a custom hood. A huge central island in contrasting finish with a butcher block top and prep sink is the heart of the kitchen and afford ample space for casual entertaining, food preparation and family meals, and homework sessions. A casual dining area overlooks the gracious den. A huge PANTRY off the kitchen acts as a more informal staging area for cooking and events, with walls of open shelving and custom tables that function as additional counter and storage space. This room also contains an additional complement of appliances that includes a 48” SubZero refrigerator, and Dacor wall oven, warming drawer and microwave. As a full walk though room, the back side of the pantry opens to a mudroom, hallway and second entry that are paved in hand-made Mexican saltillo tiles, with extra storage room. This back hall provides access to a second staircase that leads to the carport. From the kitchen, two steps lead down to the FAMILY ROOM, with a massive limestone fireplace wall, surrounded by custom alder built-ins that enclose audio and video systems and instill the room with handcrafted warmth and detail. 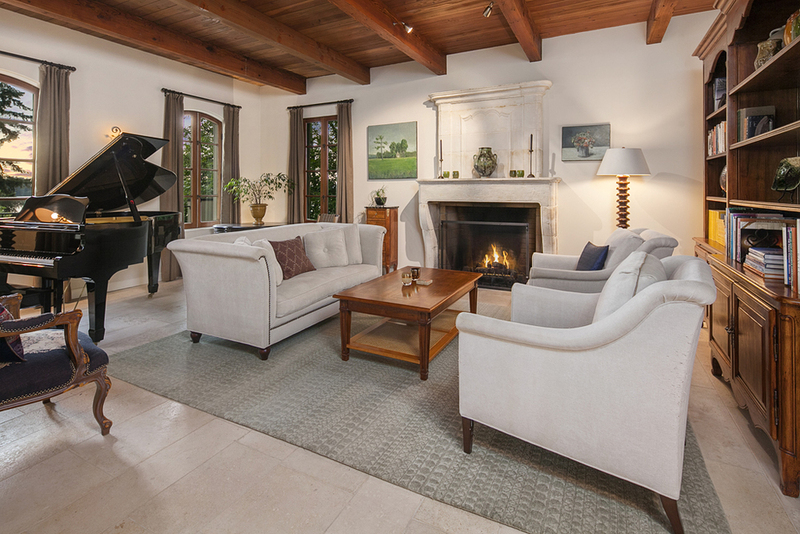 As with the living room, exposed beams are set into plastered ceilings with recessed lighting. Twin sets of French doors open onto the outdoor patio and kitchen with built-in Viking grill. This is a delightfully enveloping room that can function as a breezy indoor and outdoor space in summer and a cozy family enclave during the cooler months. One of the defining features of Maison des Volets is its exquisitely crafted MAIN STAIRCASE that frames the entry, then gracefully winds up to second floor. The treads are solid, wide plank fir that match the wood flooring throughout the rest of the house, and the banister is exquisitely crafted from natural wrought iron in a modified floral pattern that references French architecture. This stair and associated landing serve as a connecting hallway for the three upstairs bedrooms and their associated spaces, and gives a lovely outlook over the foyer and central living space. A spacious MASTER SUITE occupies the northwest corner of the upper level, separated from the rest of the top floor by an elegant hallway. The room is a quiet oasis of clean surfaces and daylight, anchored by a beautifully built-in wall of custom furniture built-ins. Space is afforded for seating and correspondence, and the room is sublime in its privacy and setting. 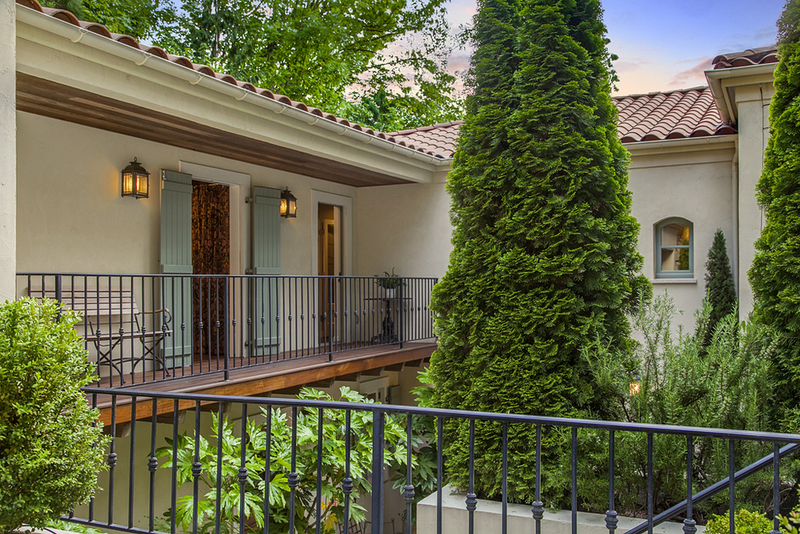 French doors lead to a large private patio that overlooks Lake Washington and Seward Park beyond. The adjoining MASTER BATH is a similarly restful and rejuvenating space, with a continuation of the fir floors that run throughout the house anchoring a wonderfully eclectic arrangement of bath furniture and fixtures. Two vanities are built into custom, hand painted chests with natural limestone counters, while a grand, two-person soaking tub is the center piece of the room, built into a limestone covered base and centered under a large pair of casement windows. The bath tub enclosure affords private outlooks over the lush side yard and cooling breezes. Twin linen closets surround one of the vanities, providing ample storage for all necessities. 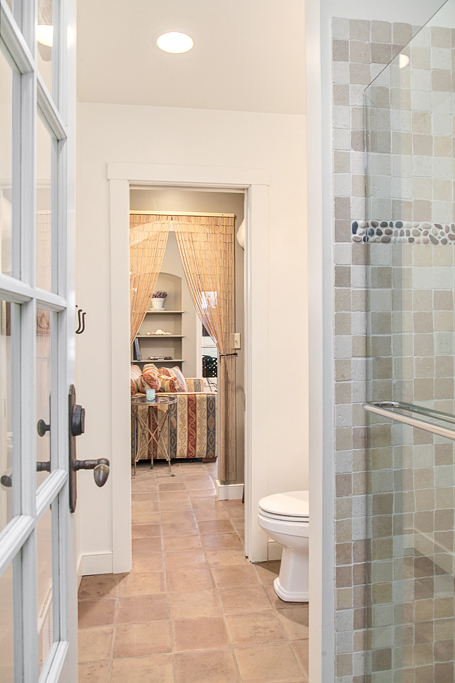 Completing the master bathroom, a spacious separate room contains both a lavatory and bidet with its own window overlooking protected green space. The master suite, as a whole, is completed by a well-organized and carefully arranged dressing room that overlooks the front courtyard. A SECOND BEDROOM on the west side of the house includes open floating built-in shelves around a pair of French doors that overlook the back yard and lake views, and offers a wall of closet space. The scale is spacious and comfortable with plenty of room for additional seating or a desk. The THIRD BEDROOM is located in the southwest corner of the house, and is surrounded by casement windows that flood the room with natural light and frame lake views through original old-growth trees. This is a delightful tree house of a room that really emphasizes the house’s unique topography. A discreet back hallway leads to a beautifully appointed Jack and Jill bath that the room shares with the rest of the floor. It includes a full tub and shower with subway tile surround, a period style pedestal sink, and a private lavatory area. A small room off the south end of the hall offers great home STUDIO or office space – the perfect personal retreat. It is accessed via a pair of French doors and overlooks a stand of native red cedars. The upstairs hall continues beyond this room to an ipe deck that affords tranquil views over the entry courtyard and leads directly to the garage and shop areas. An intimately enclosed side stairway off the entry leads down to the lower level of the house, stopping at a mid-floor landing which contains a spacious laundry room with custom built-ins, the utility room with lots of underground storage, a naturally temperate wine cellar with paving stone floors and custom racks, dry sauna, and a large storage and shop area. This level then steps down to a lower floor with exceptionally high ceilings and huge windows that overlook the back yard and lake. The southwest corner of the lower level contains a spacious MEDIA ROOM that opens onto a private ipe deck with easy access to the hot tub and a series of terraced decks meandering through mature, native landscaping to a level and more formally planned back yard. The lower deck is covered for multi-season comfort and protection from the elements, with outdoor speakers and Morrocan pendant lighting. 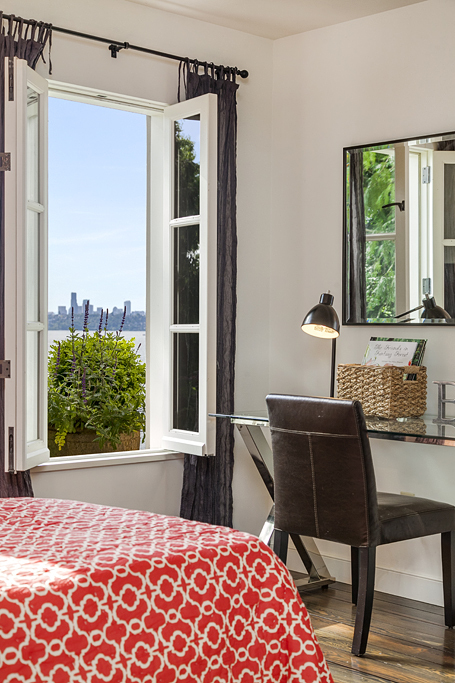 Two ADDITIONAL BEDROOMS occupy this space and share stunning views over Lake Washington and Seward Park. One bedroom is currently optimized as a large home office with easy deck access, while the other is a spacious private enclave for visiting guests or family members. This second bedroom shares an ensuite Jack and Jill bath with the rest of the floor, offering its own private lavatory and vanity area, attached to a central bathing room. All floors on the lower level are wide plank, solid old-growth fir with a deep finish that emphasizes the wood’s naturally occurring grain pattern. 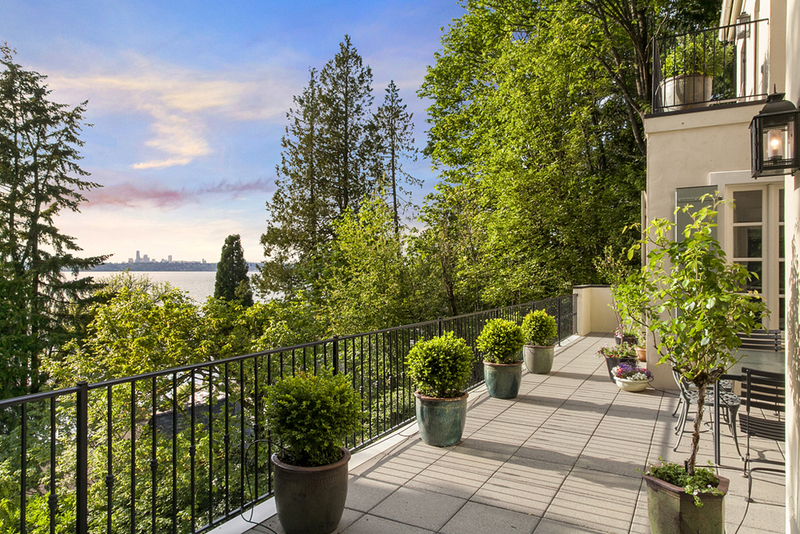 The home’s unique hillside topography allows it to sit majestically above its backyard, capturing iconic views over Lake Washington and Seward Park. This siting also ensures that all rooms on the water-side are above grade, and can be bathed in natural light through full-sized windows and French doors. The series of terraced decks, patios and walkways that leads down to the lower, level back yard provides access to conveniently located storage and garden areas and traverses two routes down to the lake – a direct staircase, and a meandering gravel path that leads poetically through gardens of rosemary, lavender, hydrangea and other native plants. Mas des Volet was built by inveterate gardeners, and their devotion and sensitivity has yielded mature and lush landscaping that eloquently frames and compliments this extraordinary residence. The house was specifically sited to maintain and preserve as many native trees as possible, and the result is a setting that is framed and protected by old-growth cedars, massive laurels and vine maples. The level lawn that connects the house to its stunning lakefront is punctuated by beautifully integrated formal gardens and sitting areas that include a patio, outdoor contemplation garden and fire pit by the lake. An original garden shed from the property defines the flower garden, while a charming lake house is available for entertaining and relaxation. A perfect hub for dockside parties, warm weather escapes, guests or caretakers, the LAKE HOUSE is a fully functional studio house with an efficient woodstove, full kitchen and bath that is autonomous from the main house, and opens directly onto a large patio via French doors for lake access that is truly singular. The construction of the lake house matches many elements of the main house, with vaulted, exposed beam ceilings, hand-made tile floors and custom built-ins. 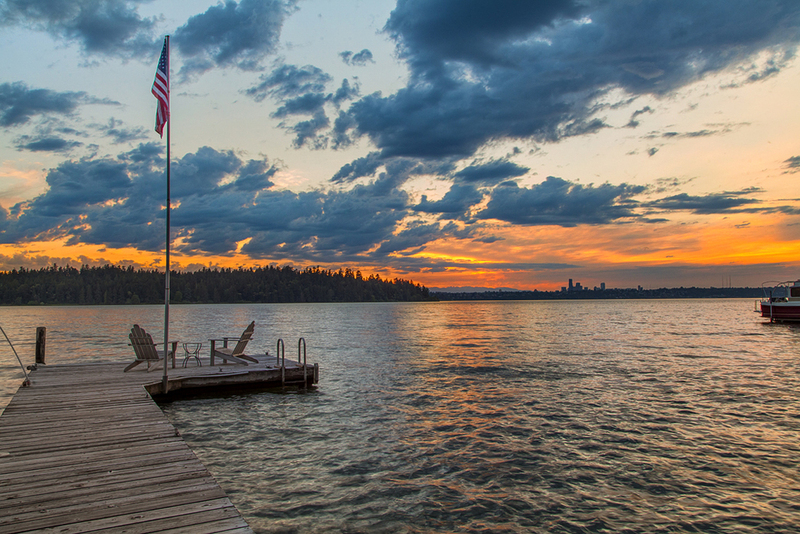 A dock serves the property with year-round moorage.